..and the process started . Devi (Chennai, India) on 12 May 2014 in Plant & Nature and Portfolio. 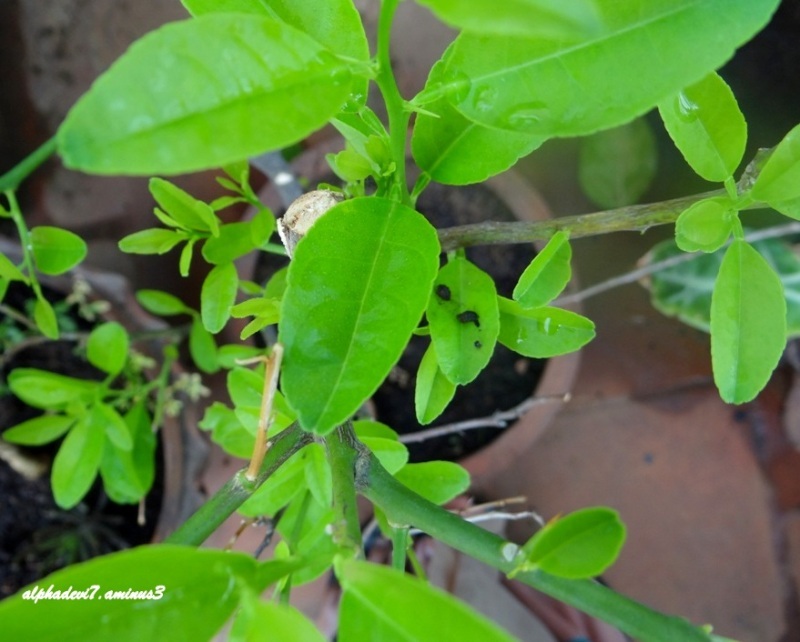 A couple of months ago my neighbour and I spotted these butterfly eggs on the lemon plant. She said that her lemon leaves were always eaten up by the caterpillars but she didn't have the heart to get rid of them by spraying killer liquid. And so, we waited with bated breath to welcome the butterfly. You can see the black coloured eggs. Shall soon appear a caterpillar and thereafter the butterfly, it's the cycle of life. Excellent composition. Thanks for sharing, Devi ---- I hope it will be a gorgeous butterfly as you sacrificed the poor lemon leaves!!!! But, I guess, thats Nature. Ooh, I would love to see what kind of butterfly it'll be! The beginning of an interesting adventure. A great find and a nice shot, Devi. It will be an interesting series with a beautiful butterfly appearing at the end.